GameDay freebie and soon to be sliver deck staple. Great flavor. That’s one hungry whale! Nice ability on these guys. Make them swing at you then strike back. Kind of like a slower Entreat the Angels, but pretty need with mana dorks. A ‘watered down’ Baneslayer Angel. Someone at Wizards of the Coast really likes that Isperia ability. You get a nice ‘Murder‘ effect out of it and the drawback is not too bad. A dragon deck auto-include and upgrade to Shivan Dragon. Nice little 3-ability enchantment for Commander decks. Liliana Vess‘s Ultimate – in card form. This particular card is most likely going to see some serious play. Imagine any creature you wish had flash and pair it with this. Neither will be counterable. Of course it requires a creature in your hand otherwise it will do nothing on its own. This is the kind of rare that’s going to be in huge demand as it’s going to be played in just about all formats that can use it. Be sure to grab foil ones for your Commander deck. Don’t forget that this is also very very awesome with Snapcaster Mage . But of course, most of you already knew that. Nice! a Rare ‘paneswalker pet’. Looks like Ajani is confirmed for 2014. Nice ‘mill ‘ creature. It’s somewhat inefficient, but you do get potential value if you mill the right card. This is actually the most efficient pet so far, if only its stats were reversed. It saw competitive play before. Will it rise from the ashes again? Why did they reprint this? I hope that if a new Garruk is in 2014 he’s awesome. Stay tune for another Spoiler later on as we continue our brief overview of the Magic: the Gathering 2014 Core Set. If you’ve played standard recently you probably encountered decks running Thragtusk, Sphinx’s Revelation and way too many Shocklands. People will just spam these out often with no fear of reprisal and missplay all over the place without any backlash. Something must be done about this! I wanted to punish these less optimal plays with something appropriate. Taking careless Shockland life loss just because you will recoup it when you cast Thragtusk or Sphinx’s Revelation is just wrong. You still need to know when and which lands to play at all times. Wouldn’t it be great to counter their Thargtusk and teach them a lesson? Well, you ‘can’! Too cool even for flavour text! Playing him on turn 4, flipping a burn spell and having the opponent flip a Thragtusk. They take 5, you fly over for 4 damage plus burn them for 3. That’s 12 damage right there! I wanted something that would probably do some nice, quick and cheap damage. Enter the Delver. Fine print: Not as good as Dark Confidant. Finer print: not even close. After my friend tried it in his Black/White Zombies deck, he confirmed it was the worst card in his deck. I argued that it was because he couldn’t spam his cards fast enough (he was also playing Obzedat and Blood Baron). He needed more ‘aggressive’ low-cost threats aside from the zombies. He quickly subbed out his Scriveners for more Blood Artists and Cartel Aristocrats and started winning – a lot. The first thing you will notice is that it is chock full of cheap draw spells so as to fully abuse the Blood Scrivener when we have no hand. Playing a Thought Scour draws 2 cards. A Desperate Ravings is rather nice as well ( netting us 2 cards).It gets sexier with the flashback. Even the versatile Izzet Charm nets us the best of our top three cards with an empty hand. We are basically trying to be efficient with our cards and get all the little advantages possible. Standard is however NOT the super efficient and mana-tight format that Legacy is. People play high mana cost cards and games tend to last on average past turn 6. We are trying to maximize the effectiveness of Blood Scrivener and Duskmantle Seer when in fact they are more like support cards (something I realized after quite a few games). We were trying to do too many effects that gained us small bonuses but that do not generate enough of an impact in the overall course of a game. This is basically greedy, for lack of a better word. We can’t hope to just play multiple card drawing spells in order to draw something ‘awesome’ because there is no big game-changer to draw. These spell were pretty much superfluous as we are adding card drawing on top of cards that already make us draw. I know it sounds like I am repeating myself a lot in the previous paragraph, but it’s very important to get that point across. We just plain need more business spells. The majority of our damage will come from a burn spell, a Snapcasted burn spell, Delver or Duskmantle Seer. Originally, I wanted to play 2 Bonfire of the Damned as it was a 1 cost when flipped for Duskmantle Seer and when you played an untapped land on turn 5, would allow you to ‘Pyroclasm‘ your opponent’s side of the board. This is rather nice and probably would clear annoying flying blockers out of the way (ie: pesky Longering Souls tokens). In the end, I was convinced to not play this card, much to my dismay. The argument being that Duskmantle and Blood Scrivener prevented me from ‘miracling’ the card since there was a greater probability that it would not be the first card drawn in the turn. It did really like it late game also as this deck had no other real late game cards (and no, 2 Duskmantle Seers is not going to cut it). We needed to figure out the deck’s manabase and it was not an easy task (to this day I am not really happy with it). One thing that was rather nice is that all our creatures play nicely with each other – they are all Wizards. So I dusted off a couple of Cavern of Souls and added them to my pile of cards. The main color, by far was blue followed by red and then black. Black mana was barely required really, it was only for 2 creatures in the deck. Easy to cast, hard to properly make good use of. Another thing we wanted to do is to maximize the use of the two good Grixis split cards for this deck while keeping their numbers low. This was of course due to not wanting to flip them to Duskmantle Seer and take 5 damage shots. I was probably more excited about Turn/Burn than Far/Away but both were worth trying out. We envisioned a few common scenarios where these cards would shine (a lot of which involved Geist of Saint Traft, Angel of Serenity and Restoration Angel. Turn could for example simply take away flying from a would-be Dusmantle blocker and burn the opponent for 2. Far could be played in response to them casting a Restoration Angel, bouncing their Restoration target and sacrificing their Angel. These are just quick example really, you could do so much more. The finest point of all was that of the Runechanter’s Pike. Who played this cards still? No one, that’s who. We could finish off an opponent old school pike style! of course we would need to draw it amongst our 60 card pile. No problem right? I sleeve up this 60 card monstrosity in nice blue non see-through Dragon Shield plastics. I don’t have to play a check list card instead of a real Delver of Secrets. Oh joy! I like the fact that the plastics are already sort of curved as it keeps the cards well together and doesn’t make them slip and slide all over the place. I get to the store late due to our fabulous subway system experiencing technical difficulties, but the store owners decided to wait for more people to enter. Lucky me! Round 1 is called and I am paired against my roommate. Unlucky me! Game 1 is basically me trying to contain the zombie swarm. With only 2 Pillar of Flame maindeck, it’s a rather tough task. Big daddy himself comes in to finish the job. Also, his turn 1 land was a Cavern of Souls, so much for any hope of countering anything save Lingering Souls of Cartel Aristocrat. Game 2 is about false hope. I get off to a decent start with a flipped Delver on turn 2 and his turn 3 play is a Blood Artist and a Orzhov Guildgate. I get all excited when I land a Duskmantle on the battlefield. The excitement is quickly extinguished as my opponent drops some Lingering Souls into play, guaranteeing himself blockers for at least the next 2 turns. Oh and I am quite simply trapped between a rock and a hard place, since Blood Artist makes attacking a losing proposition as well. He flips a land with Duskmantle‘s effect while I flip… another Duskmantle! I basically die a rather sad death while wondering why I let them convince me NOT to put Bonfire of the Damned into this deck. Oh joy! he leads off with a Diregraf Ghoul. I zap it on my turn with a Pillar and he plays a Lotleth Troll. Had I known, had I known. Who plays a turn 2 Lotleth Troll versus a red deck anyways? he gets stuck on two lands and I’m still having tons of trouble killing him. He uses removal spell on all my guys plus I’m not drawing Duskmantle to really race him. He has me at 6, I Syncopate a Dreg Mangler and then use the Away half of Far/Away to make him sacrifice his Troll. I attack for 2 with my oh so threatening Blood Scrivener who has not drawn me any cards this game yet. He plays another Dreg Mangler that I can block, but choose not to so that I may get to untap and finally draw an additional card with Blood Scrivener. Unfortunately for me, Scrivener has 1 toughness and a non-morbid Tragic Slip is enough to send him into my graveyard. I don’t draw any kind of solution to the Mangler and end up grabbing my sideboard, ready to make Game 2 modifications. What’s tragic is that it kills 11 out of my 15 creatures, WITHOUT the Morbid trigger. Game 2 starts off with me keeping a Steam Vents + 3 Pillar of Flame hand as well as other cards. He does the usual Gravecrawler and I Pillar it. Victory! haha, yeah right! These petty burn spells only slow down the zombie hordes but don’t stop much. I actually start to fight back and do things like attack with Duskmantle Seer. He Abrupt Decays and Slips a few of my dudes but the Seer keeps going. As fate would have it, he flips a Liliana of the Veil to Duskmantle Seer‘s ability. While he does take 7 damage overall that turn, it’s not enough for me to win. He drops Liliana, makes me sacrifice my only creature and he’s back in the game. Later on, he even manages to ultimate me the turn I dropped a Duskmantle Seer and a Delver of Secrets into play. I keep the 2 lands pile with Seer hoping to finish him off on my turn. It’s all for naught as he Tragic Slips my Seer and pretty much extinguishes my hopes of winning short of me drawing a couple of burn spells off the top. This does not happen as I am already not packing that many to begin with. I start off with a turn 1 Delver which actually flips on my turn 2. Well, at least I got that part right. He goes turn 2 Breaking/Entering milling me for 8. I attacked the following turn adding a Blood Scrivener into the mix. His turn 3 is an Uncovered Clues. The clue I am uncovering is that if I lose this match, I’m going to toss my deck across the room (well, not for real, I mean some of those cards are worth money. I should however bring a crappy all commons deck and pitch it across the room when I want to rage, that way it will add to the ‘realism’.) He Breaks me x 2 next turn, but I’m doing damage with my dudes and he’s not doing much else really. He gets a Consuming Aberration into play but I am still flying over with my Delver. A Duskmantle Seer joins my end of the field and it officially does what it’s supposed to do: make my opponent lose life and win me the game. Phew! Finally! The ensuing game is just weird. I start off rather decently then a Consuming Aberration resolves on his end with me having no actual answer for. At this point in the game the only 2 cards that can answer it is a Far/Away (my only one) and Unsummon paired with a Syncopate. I draw no such cards. I chump a couple of times but I am eventually consumed by his 18/18 blue/black horror. That’s right, punish the greedy Duskmantle Seer! I will spare all the unnecessary details we already know about this match-up. I did however manage to draw a lot of extra cards off of Blood Scrivener. They were for the most part largely inefficient against the Zombie swarm. I even ‘drew’ more cards with Seer, but nothing that would do me any good. In fact, I wouldn’t even have been able to tutor for a card to get me out of this mess. This is probably a sign that the deck: the time where you cannot even fathom an ‘out’ or series of events that would lead you to win the game (aside from opposing missplays, though opponent forgetting to attack is not on the top of that list). The second games starts of by looking somewhat optimistic with me attacking thanks to Duskmantle Seer but of course he is negated by a Lingering Souls on the following turn. I can hope to drop another Seer and ‘burn’ him out, it is rather unlikely though as he plays about the same mana curve as mine possibly lower even. I consider my options and just go for it. Nothing better I can do at this point as my sided in Rolling Temblors don’t really do all that much if anything at all. I flip twice to Duskmantle and he rewards me for his misuse by killing me. Nothing this deck ever did aside from attacking with Delver and revealing cards with Duskmantle ever seemed very relevant overall. Sadly, I would rather try the more low cost, aggro, burn route over rely on a 4-drop that may end up killing me just when I am turning the tide. Izzet Charm seemed to be by far the worst card in the deck (not much to counter versus what I faced. It’s mainly there versus early Sphinx’s Revelations anyways. Desperate Ravings would be cool if I am hoping to draw ‘miracled’ Bonfires, Olivia Voldaren or even something like a Talrand, Sky Summoner. Thought Scour seemed like an ‘ok’ Turn 1 play barring a Delver of Secrets but I would much rather have had it be an early burn spell. The deck was ambitious to say the least. It tried to play creatures that don’t necessarily see much play (save McSnappington). It probably would have been much much more effective as an outright burn deck with cards like Bump in the Night and Vexing Devils. That is a story for another time (soon, I promise). Coming soon, once I get more live playtesting in. I promise. Charles, who is a blue mage at heart completely took out the 2 main cards that were the focus of the deck and instead make it into a Talrand/ Goblin Electromancer deck. He was however, not aware that the Fuse spells (split cards) do not count as 2 separate spells when cast. Also he was under the impression that Goblin Electromancer reduced each half of the card (not so!). I obviously hated the list. I would have still hated it if the Electromancer/Talrand combos were applicable. Your thoughts? Another Magic comic, another promo. This time it’s rather underwhelming but it sure does look nice! Hopefully the comic artist will change soon as I find it rather lackluster personally. Who knows what the next comic book promo will be. Will we get another Standstill quality card again? That Electrolyze promo they gave a few comics back is starting to look good now, eh? It’s been a while since we haven’t seen them and Wizards of the Coast deemed it was about time to bring them back. They last appeared across the Time Spiral block and Onslaught block before that. These little slivers are a hard tribe to keep down. They seem to have taken a more humanoid form. 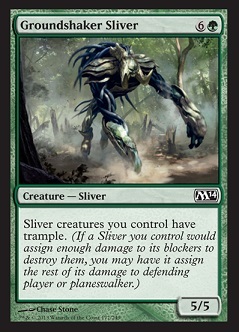 This time however… they don’t boost your opponent’s slivers. Oh my! that is quite a change and it avoids awkward mirror matches. The ones pictured here appear to be slightly higher costed than what we are used to. They are however just common and uncommon. We have yet to see the full legion. Legion? Perhaps a Sliver Legion reprint? Who knows. One thing is for sure though, sadly or gladly, no Sliver Queen reprint. The decklist for the single event deck for Dragon’s Maze has been spoiled and it looks to be a decent value without being over the top. The deck actually seems somewhat fun as well. It is a ‘Junk Tokens’ kind of build. Yes, this is where the bulk of the rare value went. At an MSRP of 19.99$ (one that store are very likely to stick to, for a change) this is a great inclusion indeed. Wizards of the Coast is really pushing Modern by practically giving these to us. In the deck, the only purpose of this card is to allow us to flashback Lingering Souls. We all would have prefered an M13 dual or something else here, but this is a Populate deck. It really didn’t help its value that it was a Pre-release card as well. Still, I’m all for fun when it comes to these decks – so Populate away! This card is rather good in terms of value and playability. It’s not insane value, but it trades really well. In a token strategy it acts as a kind of lord, but not the generic kind that just gives +1/+1 to your team. I have seen it played in certain Naya Aggro lists or Human decks and it’s actually quite decent. Ah! Another card that is great for the deck in terms of playability but bad in terms of value. The art on this card is my favorite part. He works well with the fact that the deck will want to spam a ton of creatures. He basically gets to attack and probably make your opponent not block anything allowing you to inflict mass amounts of damage, if not the lethal blow. Not really good in terms of value, but I approve of his inclusion. This is probably the first card out of the deck and into people’s trade binders. It’s bad, like really bad. I guess it’s in there to educate the newer players that some cards are not as good as they seem. While I understand this, I do not like the fact that it’s in there. They could have put Scion of the Vitu-Gazi in there instead. Oh yes! take me to Value Town! this is one of the hotter cards from Dragon’s Maze and it’s quite cool to see it included in this Event deck. This and Godless Shrine pretty much justify the 19.99$ face value of the deck by themselves. It fits in nicely in the deck theme as well, they didn’t just toss in a random big rare. Post rotation, this thing will probably go higher in value despite being in the Event deck. Great casual card to put in here. While it’s not really super competitive, it’s not half bad really. In terms of value, we can probably look elsewhere though. Probably not great in terms of value here, but it’s a great token genrator. It allows you to overcommit and still have some gas left for the late game, if there is one. This plus Champion of Lambholt can be a blowout mid to late game. Much like Growing Ranks, it does not do much on its own. It’s probably never going to make it in any serious token decklist, but it’s got a great casual appeal (which would explain its 4$ price tag). You can probably shove this in your trade binder and use it to get other cards you want. That’s 18$ right there! this is something that a lot of the previous Event decks lacked (all the deck value was Rares or there just wasn’t much to begin with). The decision to only make one Event deck this time was probably due to the fact that there was always one Event deck that would easily outsell the other. This would cause the retailers to have to ‘overpice’ the popular deck and ‘underprice’ the other so as to not be left with all of the less popular decks. Also, Ready/Willing would have been a perfect addition to this deck. ” Even if Wizards of the Coast put 100$ bills in the boosters, people would still find a way to complain”. Yes, it’s cheesy for those of you who know where I’m going with this. I didn’t want to outright call the article by its deck name. Contrary to what it sounds like, this is not a black deck. It is not a blue deck (ie: Mana Leak tax). It is 100% white (aside from lands and artifacts of course). The origins of the deck can be found here . It was in fact created about 6-7 years ago. This was back when the Legacy format was in a constant state of evolution and players were experimenting various combinations and brewing was fun. I remember always trying to build the weirdo decks that I found all over the internet back then, before it became cool. I sound soooo old, no? I always kept the Death and Taxes deck sleeved up though. It was my go to deck to punish greedy players with. I was not going to hide behind my Force of Wills and Brainstorms and pretend I was awesome. I was going to try and outplay and utilize all the tricks this ‘white weenie’ variant had at its disposal. I did not hate blue cards, I just wanted to do something different. The deck has gone through quite a few revisions as is to be expected since Magic: the Gathering is an evolving game. Certain cards become outclassed due to the power creep while others retain their playability. Attacking with creatures is cool and all, but I was more interested in their abilities. In this day and age of ‘enters the battlefield’ creatures, it’s refreshing to see that the oldies are still good with their TAP abilities (requiring you to conquer the summoning sickness before you an activate. Of course, after a quick glimpse you quickly see that Aether Vial is a key factor to vanquishing this ‘summoning sickness’. It allows you to essentially ‘Flash in’ creatures at the end of your opponent’s turn. That way you can dodge some sorcery speed removal (Pyroclasm,etc). It is also not entirely wasted if you happen to draw a second copy as you can always keep one on 2 counters to flash in something like a Phyrexian Revoker in response to something they would activate after casting (ie: Pernicious Deed, Sensei’s Divining Top). It was banned in Extended and now is banned in Modern. Surprised? Its main interaction is with Mangara of Corondor and Karakas. You flash Mangara in at the end of their turn, activate his ability whenever ‘needed’ then bounce him to your hand with Karakas in response to his activated ability. You basically exile a permanent per turn. Maybe even ‘chump’ block something in the process. Of course you can simply recast Mangara each time, but he can be countered when you do this. Also, if we are short one Karakas, we can vial in a Flickerwisp in reponse to Mangara‘s activation to accomplish the same thing. This is a one time use though. It is still very effective as Flickerwisp essentially does the opposite of what Mangara does sometimes: it saves one of our permanents or ‘resets’ it. One example of this is pretty straightforward. It is our turn 3 and we cast a Flickerwisp. We were hesitating if we wanted to use our Wasteland to set our opponent back a turn, only to realize we can now do both. We target our own Wasteland we used to cast Flickerwisp with its ability. At the end of our turn, Wasteland will re-enter the battlefield untapped and ready to be used on an opposing non-basic land before our opponent can get to untap. This is pretty nifty ! We are up a 3/1 flier and they are down 1 land and potentially color-screwed. The above play may seem trivial if you are mostly a Standard player, but Legacy is a very ‘land-tight’ format. If our following play is landing a Thalia, the opponent will have a hard time recovering if he absolutely needs to cast non-creature spells. It gets even worse if we get to tap his mana at his upkeep with Rishadan Port. We’re basically Stone Raining the opponent at every opportunity, without actually casting a land destruction spell. Effectively we are ‘taxing’ them. Sometimes this can even be effective on decks that run creatures like Noble Hierarch for mana. This is thanks to the gem that is Phyrexian Revoker. I loved playing it in Dragon Stompy builds but even more in something like this. In this situation Revoker is better than Pithing Needle. It can’t negate abilities on lands but it can negate other mana abilities (such as those on mana dorks). It also does good work against opposing Knight of Reliquary. If you are getting beaten down by a Umezawa’s Jitte -equipped creature, you will have a hard time recovering. Even if you Swords to Plowshares the equipped creature, your opponent probably has more creatures than you have Swords. Phyrexian Revoker to the rescue! Is there anything this guy can’t do? Block…. never ever block with it. At one toughness it does not survive anything. Blocking is probably bad unless you are getting in the way of a pesky Goblin Lackey that’s just itching to summon its friends. You might also want to consider it if your life total is very very low or if you probably named the wrong card with its ability. Our manabase is pretty sweet for a mono-colored deck. We only really ever need 2 white mana at any time. This number drops to 1 if we manage to get an Aether Vial going. We can afford to 8 colorless lands plus Cavern of Souls (usually set to Humans). We also don’t have to sink a lot of money into our land base, well at least not as much as most decks. Lands are the spice of Magic. Karakas has gotten rather expensive due to the number of things it can accomplish in Legacy (ie: return opposing Emrakul to owner’s hand). I suspect a more steady supply of Judge promos will continue to drive the price down. Also, I always found 2 is also an acceptable number as you never ever want 2 of these in a game (especially not in an otherwise good opening hand). The nine Plains are probably one of the highest number of basics I have seen in a Legacy deck ( a good one at least). Go ahead and pimp those (your choice of FOIL, textless, textless foil, white border, Portal,etc). These are the bread and butter of the deck. You are going to need to attack to win. No planeswalker ultimates, no 2-card combo wins, no burn spells. In order to do this, the creatures need some kind of evasion as more and more Legacy decks contain creatures these days than ever before. 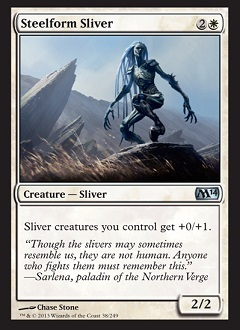 This card is probably the best 1-drop creature in White. It protects your dudes, it allows them to get through or at the very least – it endlessly blocks an opposing creature. I like it a lot in every deck that runs it (flashback Maverick). I think I covered most of what needs to be said about it in the GW Maverick article. It’s a bird, it’s a pla….. No, it’s definitely a bird! What a bird it is! This card has more or less replaced Serra Avenger / Stonecloaker from previous Death and Taxes decks. It’s just a great card. While not every single deck searches in this format, the mere presence of fetchlands make it very potent. It effectively kills a land if you flash it in when your opponent activates his fetchland. He really needs to be lucky to find his land in the top 4. It gets even better versus cards like Natural Order and Stoneforge Mystic. No flavor text, pure ability text! Here’s one legend that’s way better in Legacy than he is in Commander. With Karakas banned in Commander there are fewer ways to utilize/abuse his ability. If he remains in play for a full turn he is guaranteed to whipe something off the table. Previous iterations of the deck had more neat tricks that abused his ability such as Thousand-year Elixir. Not only did he gain hast, be he got to untap in response and remove something else as well. The number of Mangaras in the more recent versions has also decreased for the better as drawing multiples is not always that great (even if you are going to 1 for 1 things without Karakas). In the ideal circumstances he can keep your opponent down a threat each turn, but he is probably a horrible card to draw when you are behind. Also, he used to be worth 50 cents. Some would argue that he is the card that has really replaced Serra Avenger in the deck and I would be inclined to agreee due to how the current metagame is. Always blocking Tarmogoyfs and attacking pas them is great, even more so when you equip him with a Jitte. The ability on Jitte will trigger twice which is sweet. It can also mean that you kill them the following turn if he goes unanswered ( 4 damage the first time with 4 counters – remove 4 counters next turn, strike for 10 and 14 if you remove the 2 fresh counters). Scary stuff! His protection from black is not too bad either, but is not that great at a time where most removal is white and red. He’s also another human, which is great as Cavern of Souls is usually set to Human. Equipment tutor with a body. Check! Uncounterable Mystic with Aether Vial? Check please! 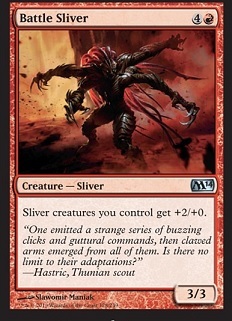 I don’t think it will ever really go out of style and at the very least you can always shove one in any Commander deck that runs White and a few equipments. A reduced cost Glowrider with the legendary clause. A nice little taxing card plus she’s better than the original in combat. She may or may not get benefits from Karakas but that’s not important really. She sometimes gets a hand from Eiganjo Castle. Of course Lightning Bolt will still zap her away. The main thing she does is basically act as a Stone Rain versus slower decks. She’s also another great Jitte carrier. When she was first released I honestly did not think she would be as popular as she ended up being. I’m glad I was wrong! Here we have an interesting addition to the deck but a very relevant one. When your opponent goes Show and Tell slamming down Emrakul, you will be glad to have this in your hand (yes, I know you reveal simultaneously, but you get the point!) Of course he’s even better when Vialed in and you can permanently remove something if you Vial In a Flickerwisp in response (a maneuver that pretty much everyone should know by now). He can also work pretty decently if you are planning on casting a Cataclysm post-board (you will sac him keep another creature and get back the creature you removed with him) This sounds bad, I know, but the situation has arisen and the creature usually ends up being Thalia (since now you and your opponent are both down to 1 mana.) 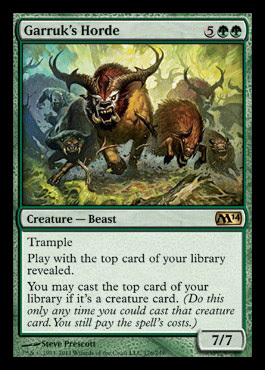 Alternatively, it can be a Mangara so that you can get them down to Zero mana the following turn. 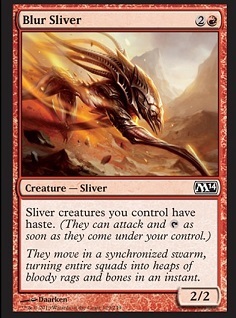 It’s also useful if you need to keep a Phyrexian Revoker in play as your creature post Cataclysm because he is locking down something good. Also, if you fell back on the Jitte wars, he can help you take down the Jitte carrier provided there are 2 or less counters on it. Human O-Ring at your service! Wether you have played Legacy or not, I’m sure you can figure out what this card is good for. Just hit THEM with the pointy end. This rather large equipment is usually our second choice to fetch with Stoneforge Mystic. It’s great because it can always provide you with a creature and with 5 mana up (which is a lot in this deck), you can always bounce it to your hand then put it on the battlefield with the Mystic. Alternatively, you can Vial In a Flickerwisp for a huge surprise blocker! (the germ token, not the Flickerwisp). 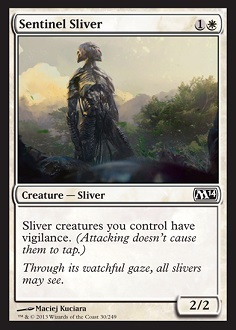 It can also help out a lot if your opponent is playing creatures that have protection from white or burn, since the now 4/4 token is tougher to burn and they won’t cut through with their sword of War and Peace. If you’re low on life you might also want to tutor it up over a Jitte as it can have a quicker impact on the field. Your opponent may just aim a timely Lightning Bolt at the creature you are trying to equip with Umezawa’s Jitte. All that for 2 mana, a creature and some combat damage! If it looks too good, it’s because it is. Often times you may just end up casting to destroy your opponent’s Umezawa’s Jitte (due to the Legend rule). You can keep swinging with your guys while keeping your opponent’s off the table (-1/-1 counters) or just buffing your guy to kill theirs (+2/+2 until end of turn). It does dominate creature battles almost all the time. In desperate times or when you are within burn range, don’t hesitate to simply remove counters to gain life. Usually you want to tweak your sideboard to the expected metagame. This will require a careful examination of what decks are popular in your area. The ‘default configuration’ here is fine as it contains various graveyard, discard and planeswalker hate. It also features a couple of cards against quicker decks (Gut shot and Sunlance). You can also try to play cards like Ghost Quarters if you do not possess Wastelands, but be sure to also play Leonin Arbiters in order to maximize their efficiency (people do play basics in Legacy after all).